So... I'm not very fond of oranges. I love all other types of citrus, but orange has never been my thing. I do have a few exceptions (orange zest, orange extract, and orange chocolate pairings), but any other form of orange is a no-go for me. 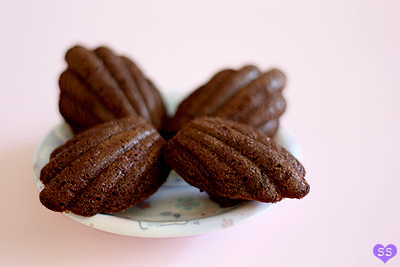 Thus, these madeleines fit the bill perfectly; they combine chocolate and orange in such a way that even non-orange fans such as myself can't resist their charm. Originally this recipe called for lemon zest, but I didn't have any lemons, so I subbed the zest of a whole orange instead. It was definitely a good move; chocolate and orange make a good combination (then again, chocolate seems to make everything better :D). This delightful recipe by Pierre Hermé was quite successful; it was one of those few instances where my cookies looked exactly like the cookbook picture. 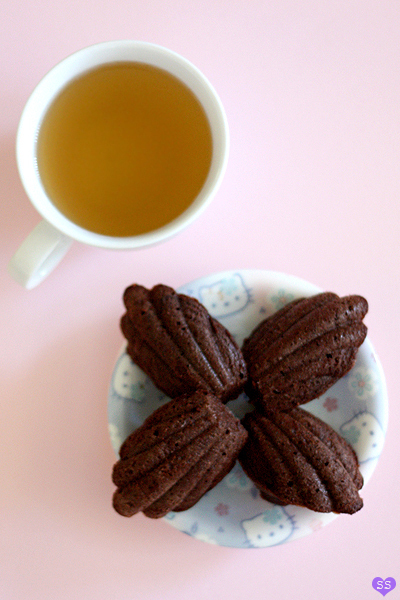 These madeleines are like mini cakes, with a tender crumb and distinctive humps, perfect with a cup of tea. 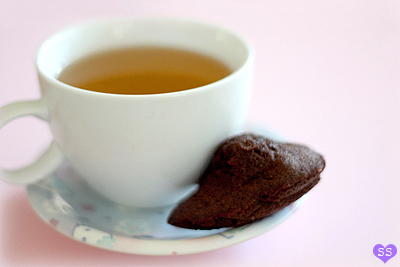 Combine and mix the dry ingredients: flour, cocoa powder, and baking powder. In a separate bowl, combine the sugar, salt, and orange zest, and rub the zest into the salt and sugar. Add the eggs and mix well. Work the butter with a spatula into a paste and then add it to the egg/sugar/salt/zest bowl. Mix well with a whisk, incorporating the butter. Add the dry ingredients and mix only until no more white streaks remain. Cover the bowl with plastic wrap and place the batter in the fridge overnight (for the madeleines to develop that distinguishing bump). Preheat the oven to 425°F. If you have a metal pan, spray and flour it. If you have a silicon mold, this isn't necessary. 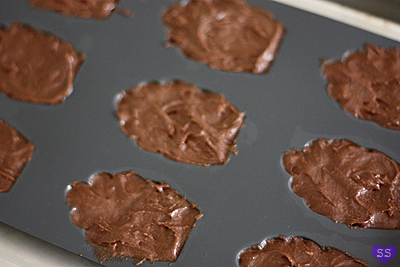 Fill the molds with batter. 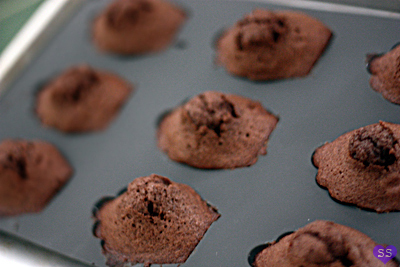 Bake them for 10-15 minutes, until they develop the bump and are firm to the touch. 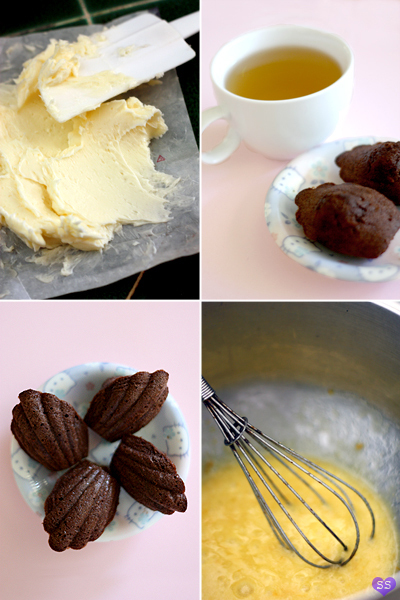 Remove the madeleines from the pan and place on a rack to cool. Then enjoy! I was going to ask if you filled the tin with less batter, but you obviously have one different than mine, with more pronounced ridges. Very beautiful, and orange + chocolate is always delicious. You're making Pierre proud! Oooh, a Pierre Herme recipe, this is one for my bookmarks :). I have a great mini madeline pan to put to use. Heather: I was actually quite surprised that they rose that much, even though I only filled the batter to the edge. Thanks! Heavenly Housewife: Yay, definitely try it out. Pierre's recipes are always delightful. This is a nice alternative to the plainer vanilla/lemon madeleine. Looks heavenly! Yes it did rose quite a bit, it was hard to tell from the bottom side but I bet it will be yummy all over and it is now on my list to make it but first I need to buy the tin for it. Aha! I'd always wondered about their shape - I guessed they were piped with the shell tip. I never knew they had their own pans! Pam: Yay, I hope you do try them out! Michelle: Chocolate & orange is indeed a delicious combo. Thanks! Sarah: Yup, and it seems that there are many out French cookies out there with their own pans, like financiers, caneles, etc.